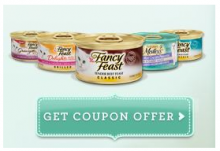 PETCO is offering another FREE Can of Fancy Feast with no purchase necessary! Take this PETCO coupon along with your Pals Card to any participating location. This coupon is good through 5/31! * If you get a “Bar Code” error, refresh your page. That worked for me! Coupons May 20, 2011 in free, PETCO, pets · Expired!